All Genny wants is to live the quiet life and to do her job at Spellcrackers.com but there's her tangled personal life to sort out first. She's being haunted by ghosts who want her help. Her witch neighbours want her evicted. Genny's sort-of-Ex - and now her new boss - can't decide whether he wants their relationship to be business or pleasure now he knows all her darkest secrets. And then there's the queue of vampires all wanting her to paint the town red - how long will it be before they stop taking 'no' for an answer and Genny's life becomes even more complicated? 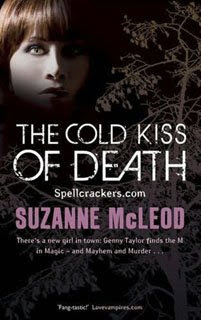 But when one of her human friends is murdered by sidhe magic, Genny is determined to find the killer. Her efforts to find the real murderer lead her to some of the most dangerous and seductive fae - but her search is hindered by the vampires, who have their own political agenda. Then when all the evidence points to Genny - she's the only sidhe fae in London - and she's named the main suspect; it's not long before she's on the run - and not just from the police - but from some of London's most powerful supernaturals. As a fan of Suzanne’s original release (The Sweet Scent of Death) we couldn’t wait to get our hands on this second offering, even going so far as ripping the envelope open with gusto when we figured what had landed. What is always worrying however is the second novel collywobbles that many people suffer from. In short, they successfully completed the original but the pressure of the second gets too much and what made the book loveable in the first case is thrown out in order to try to toe the line. With Suzanne, however you don’t have to worry, Genny is back and she’s just as sassy but also damn sneaky as one would expect of a character who’s part fae. London will never be the same again as we get to meet others from the hidden world as events seek to frame Genny as well as them attempting to break an old curse that everyone but the principle protagonista seems to know about. Great writing, enough sass to make her believable and above all a tale that makes us all want to visit to see the “hidden” side of this ancient city. Add to the mix great new characters, returning old favourites and the evidence within that you don’t get out of this life alive as Suzanne plays for keeps will have the reader guessing as to who will survive and who will fall making her perhaps Britain’s premiere Urban Fantasy Author. The only flag that has been raised in regard to this tale is a cautionary note from the way things finished in this offering and that’s that Genny isn’t given a Laurell K Hamilton makeover in book three as we love her just the way she is. A romance or two is fine but please no pursuit of justice from flat on her back. I'm waiting for it to be released in ebook form, but haven't spotted it around yet.